O.K, so I always consider the tone of my blog. Yes primarily this blog is for me and my daughter, but others are kind enough to read it, so I never want to have solely negative posts. No-one want’s to read someone else moaning now do they… However, I also promised myself that I would always be honest, if I can’t be honest on here then there really is no point. So how do I feel today? Pretty crappy really (I said I would be honest). A few things are contributing to this feeling and it has really got to me today. Firstly, and the over riding issue is that, in a couple of months my maternity leave is over and Baby will be going to nursery. I’m sure it is common for mums to feel unsure/unhappy about putting their children into childcare. So I know I’m not alone, but I feel physically sick every day at the thought. So much so that it is really affecting me. I should be looking forward to Baby’s first Christmas and instead the main feeling is dread, as 20 days after Christmas day all of this will be over. 20 days after our magical day and I will hand the most precious person in my life over to a complete stranger. I could literally cry now at the thought of what I have to do. I have only ever left Baby with Mr Hubby. For those of you who have read my blog before, you will know that we struggled to get pregnant with baby and I still can’t believe that she is here and she is my Baby. I thought it would feel like a natural progression to take her to nursery, but it doesn’t and it feels so wrong on every level. We picked a great nursery and it couldn’t be more perfect, but as time goes on the panic is building inside me. I didn’t have a Baby to hand them over to someone I don’t know, it’s awful. Unfortunately we are not in the privileged position of some and we couldn’t afford to drop my income. I have a project that I hoped would help our situation, but I am scared that I won’t be able to make it work and it will all turn out to be a waste of time and money. Negative Nelly eh?! I also have some issue’s with Baby and feel like I am making the wrong choices, not being the best mum I can be. 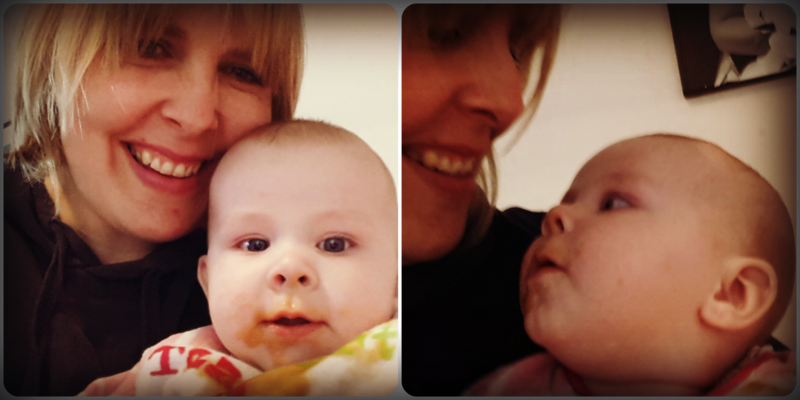 Baby still feeds (bottle feeds) on demand, she will only sleep on me in the day (unless in the car/pram) and is always asleep before we put her down at night. Am I storing up issues for the future? The nursery staff won’t sit there for hours while she sleeps on them… More to add to the mummy guilt bank. I really believe that children thrive from being with other children and learning important social skills, but what I am struggling with is that she will only be 8.5 months old when she starts. Everything in her life will turn upside down and I won’t be there for her. That guts me. I want her to be able to speak and be a more robust little person, who can tell me how she is feeling, before I put her in that situation. I don’t have the answers to any of these questions. I can’t make myself feel better about this. For now I will sit here typing this with a tear on my face and my little angel asleep contentedly on my chest. I would feel exactly the same, if I were in your position! I hate the thought of someone else being responsible for my girl (she’s 2 1/2 now). I’m lucky that I am able to be a stay at home parent for the time being, and I do count myself very lucky! Get your project under construction, see how it goes part time, and if it takes off and you can spend more time with your baby, then it’s all good in my book.